I will stop trying to find the few remaining pieces of clean carpet in the house when I am about to throw up. I will not roll on dead birds, fish, rodents, etc. "Kitty box crunchies" are not food. And should I forget, I will not lick my human's face after eating "Kitty box crunchies". The diaper pail is not a cookie jar. I will not wake Mommy up by sticking my cold, wet nose against her bottom end. The sofa is not a face towel. Neither are Mom & Dad's laps. As if I didn't love him enough on Top Chef, now he's doing a Diet Coke commercial?! Does anyone else find him attractive? Just me? Okay, we'll here's the ad in case you haven't seen it yet. I love to name things, kids, pets, other peoples' kids and pets. So yes, I am currently busy naming a dog that hasn't even been born yet. We all have our hobbies. My parents have a little prissy Yorkshire Terrier I named Lola for them because "Whatever Lola wants, Lola gets." And of course our old man Bear was really KBHR which were the call letters for the radio station on Northern Exposure. What it was 1994?! Come on, it was clever. Back in college I owned the world's stupidest dog, but he had a great name. In fact if it weren't for hubby's utter annoyance with that dog (whom I gave away to a family with a big yard because we just could not train him to use an inside voice) KBHR might have very well been Captain 2.0, new and improved. Really it's such a great name and it's been so many years I even brought it up as a possibility for a new puppy's name. See Captain could be Captain Morgan as in the rum or Captain Tony as in Tony Tarricino, the bar and the man famous with Buffett fans. And it is easy to yell, which is a must with a dog's name. Anyway, it shouldn't surprise you to hear I have had 2 dog names picked out for quite some time. I wasn't even going to entertain other ideas for this non-existent dog. But did I mention my fascination with names yet? Yeah, so, when Bre was about 3 years old we almost got a puppy. A friend's parents had labs that had a litter and oh how I wanted one. Hubby put his foot down in our 1000sq ft house and said no room for a second dog! About 2 months later we found out little Brooke was on her way and that put the kabosh on any further puppy cravings, as I was too busy naming an actual human. But in that brief window of possible puppy ownership I picked out what I still think is the perfect name for a lab puppy... Moose, especially if it's a chocolate lab puppy. Moose was Bre's imaginary friend at that point in time, sadly he left about the time she got a real live doll, um baby sister. Just think of the possibilities, Mr. Moose, could be M&M for short. And hello, chocolate Moose? Yeah, I kill myself with the clever! Of course the other name that has been tossed around for quite some time is Pete. As in, for the love of Pete did he just pee on the floor again? And the beginnings of this blog "Who's Pete, and should I be worried?" But now hubby has started getting in on the name game, which is a very good sign that he might actually like the new dog. His first suggestion was Sirius, for a black lab of course. Damn kid and her Harry Potter obsession. But again, killing you with the clever aren't we? Plus- Seriously he peed on the floor again? Okay, apparently we are obsessed by the thought of training a new puppy. The only problem here is that we really weren't going to get another black lab, as we are not trying to replace KBHR. But dude have you seen a black lab puppy? They are darn adorable, and seriously the name Sirius is really growing on me. Okay, I'll stop now. Then hubby threw out Bullwinkle who is a moose. Which I also like for a chocolate lab name. And at one time we were considering getting a Labradoodle (lab and poodle mix) which we would've totally named Snickerdoodle, like the cookie. (Yes, yet one more non-existent pet I already named) A light yellow lab would be about the color of a snickerdoodle. And it sounds really cute in baby talk. Maybe not so much in the easy to yell department though. At least we are covered no matter which puppy we pick out, we have names to choose from. So, now it's your turn, give me even more names to ponder over before I pick up my chocolate lab named Moose! The only requirement is that it has to be for a boy dog. Some of you may recall about 9 months ago we had to say goodbye to our beloved 14 year old black Lab. And now? We, and when I say we, I mean me and the girls, are ready to welcome a little ball of fur into our family. What about hubby you ask? Let's just say he hasn't exactly embraced the idea. It was his idea that we wait for a year before getting a new dog. And while I totally agree that we needed time to grieve. Well, let's just say we disagree on the timeline here. I think getting a puppy during the summer while the girls are out of school would be more fun and they could help with training. Hey someone has to wipe up all that pee on the floor and they are so much closer to it than I am. Anyway, I have finally given in and agreed that since we spend a week in July at the beach, getting a puppy after we get back makes the most sense. Otherwise we'd be leaving a half trained puppy in a kennel and starting from square one again when we get back. But mid-July is not August, and August is one year, which means we are still in negotiations. However, I found a breeder close who says they are expecting a litter soon, which would mean the puppies would be ready for new homes at the end of July. Getting the right puppy is more important than the actual date to me or hubby (at least I think it is). So while we are still discussing the timing, we are for certainly getting a puppy soon! And it's a good thing, because we've had more than one conversation like this lately. Me: If mommy brought home a puppy now your daddy might move out and leave us with our new puppy. You wouldn't want to have to choose between mommy and daddy together or a puppy would you? Smartass child: Would it be wrong if I said I'd choose the puppy? 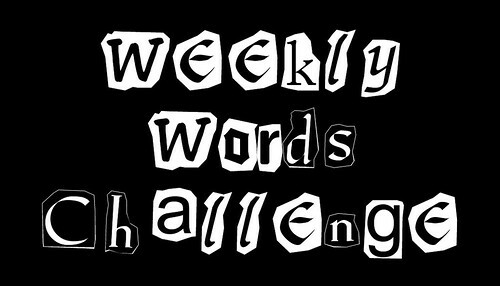 This week's words are ARCH and PURPLE. We went to the beach for Mother's Day and I have been in card hell for the past two days, so you get what I got this week. And my promise to try harder next week. 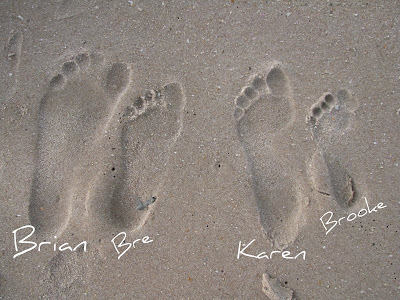 Our footprints in the sand. Can you tell which of us have flat feet and which have normal ARCHES? 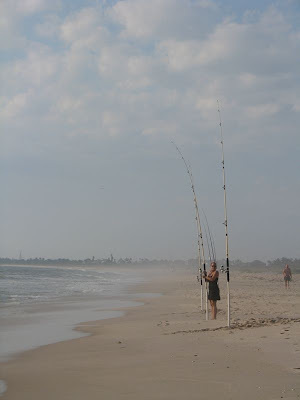 Do you see the fishing pole beginning to ARCH? She did caught a small fish. Sorry I got nothing for PURPLE. So I give you bonus photos instead. 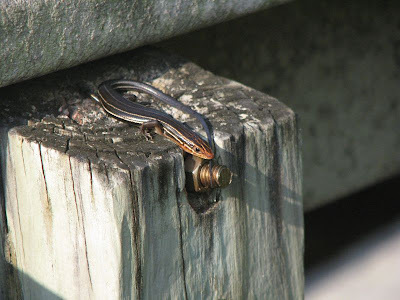 A skink getting a tan. 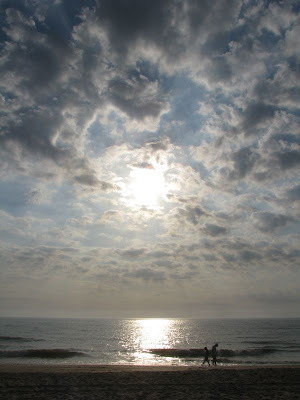 The beach early Mother's Day morning. For more info or to see who actually tried this week go visit Tink's Place. So this week I learned that Bokeh at it's most basic is an in focus foreground and a blurry background. At it's finest it is a blur of points of light in the background. And to be done properly one really needs a special lens, which lil' ol' me surely does not own. However, I went back through my archives and found a few photos I think qualify as very amateur attempts at creating Bokeh. And at the time I didn't even realize that's what I was doing. Well, I knew I wanted a depth of field, but I had no idea what it was called. Who says you can't teach an old dog? Damn and now I'm the dog again. I gotta stop doing that! The other word? SO EASY! My Heart belongs to these goofs. Wanna know more and see much better examples of Bokeh? Go checkout Tink's Place, our hostess with the mostess. So this weekend is Breanna's BIG One Zero birthday party. So I figured I pull out a few more pictures of past birthday parties. These two are probably 2 of my all time favorites. Brooke's more of a small party type of kid. NO it has nothing to do with being the second child and having no real friends of her own. Shut up, it does not! Anyway, less kids means I can spend more on decorations, snacks and goodies. Next week I'll try to finish up Bre's birthday's and tell you how the big Kickball Party went this weekend. We are up to 20 confirmed guests right now not including us. Should be fun! Have a great weekend! Edited to add... my kiddo won the "Toothy Kid Photo Contest" go check her out!